NEZO has been adding a pinch of great taste since 1929. Our long history has made us master the skills of mining and grinding salt to perfection. 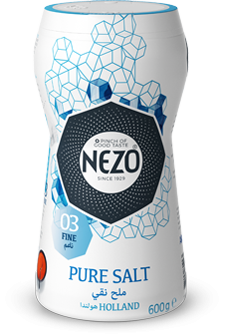 NEZO Pure 03 fine salt consists of small granules, dissolving easily. This salt is great for preparing daily meals, brining flavors to life. The shape and size of a salt grain determines the flavor impact. That is why NEZO salt is crystallized in various sizes [02-06]. NEZO 03 fine salt consists of small grains that dissolve easily and connect the flavors of the individual ingredients. NEZO Pure Salt is one of the purest types of salt in the world. The salt is sourced in the Netherlands and Denmark from underground deposits created millions of years ago by the evaporation of the Zechstein Sea.